I enjoyed the free version of Four Last Things, made for the Adventure Game Jam last year, so I'm obviously excited to see it being embiggened, expanded, embellished and other E words, ahead of its (Kickstarted) re-release towards the end of February. 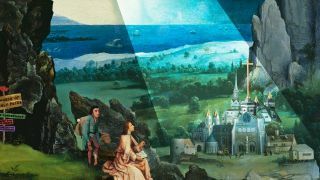 In the words of creator Joe Richardson, Four Last Thing is a "point-and-click adventure game made from Renaissance-era paintings and public domain recordings of classical music. It is about sin, and the Four Last Things—Death, Judgement, Heaven and Hell—and strives to be intelligent and ridiculous in equal measures". Richardson has stitched together various old paintings in a remarkably cohesive manner: the end result looks like those Monty Python animation sequences, only slicker, thanks to the wonders of modern technology. While you wait for the free original to download, have a browse of the recently launched Steam page, and then watch the lovely new trailer, below. Four Last Things releases on February 23, and if it's anything like that original, it will be funny as well as visually striking.